THE UNEVEN MANTLE - Our crest is a very significant aspect of our fraternity. Many years ago...in a galaxy far away (Or so it would seem. )...but really just Emory & Henry College...Theta Chi Epsilon social fraternity was born. It began in 1960, and it's founding sponsor was a man named Victor S. Armbrister (RIP). 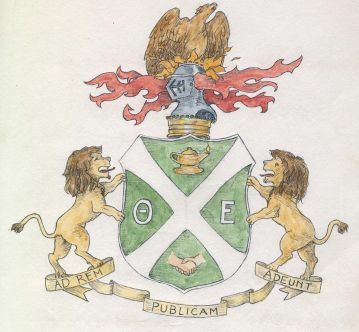 The brothers of Theta Chi Epsilon share one of the richest histories among fraternities at E&H. Our thirteen founding members began a social group that based its principles on the strength of brotherhood and unity through diversity. Our motto is "Enter into Public Service." We proudly wear our colors of green, black and white. Delta Omicron Pi is our sister sorority, and our Sweetheart is Hollie Ramey. We don't ask for a mold; there isn't your "typical Theta Chi." What we do ask for is the highest standards in our brotherhood, as we continually strive to maintain and improve upon those standards for ourselves. As a result, the caliber of brothers in Theta Chi is remarkable. We are active in a variety of campus organizations, such as Intramurals, the Sphinx, Habitat for Humanity, Blue & Gold, E&H Theatre, Blue Key, the Outdoor Program, Religious Life, Pi Gamma Mu, Beta Beta Beta, Psychology Club and many more. Above all else, we are a fun-loving group of guys who share a bond unlike any other.